Hello Kitty Delicious © 1976, 2014 SANRIO CO. LTD. Used under license. I’ve been a fan of Stephanie Buscema’s work before I met her and her talentt is only eclipsed by how sweet she is as a person. The granddaughter of comic legend John Buscema, Stephanie’s got a style unlike anyone else in comics and her artwork is fun, colorful and charming. This past year she’s become one of the secret weapons in the industry’s variant cover arsenal, painting covers for such titles as Adventure Tim, Archie, My Little Pony, Red Sonja and The Powerpuff Girls. 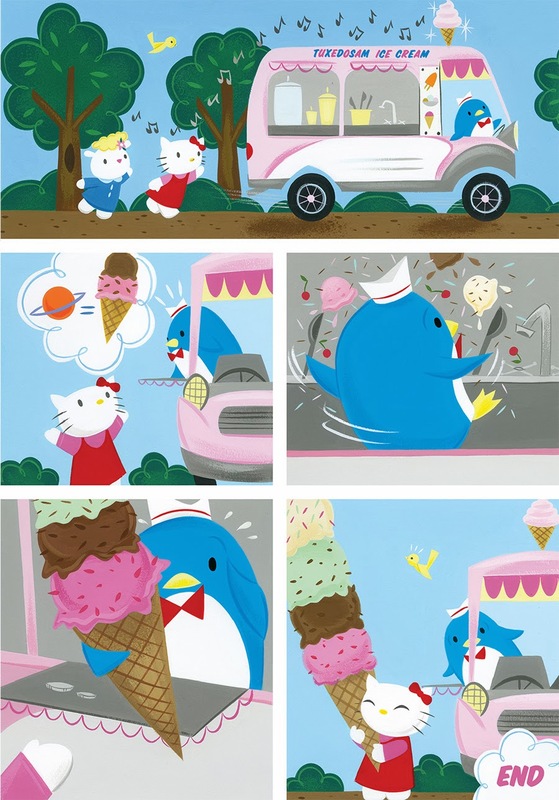 In addition, she continues to paint children’s books and other special projects like Viz Medias’ new book, Hello Kitty Delicious!, a food-centric graphic novel starring the beloved Sanrio characters. Stephanie took some time out of her busy schedule to chat about the new book. 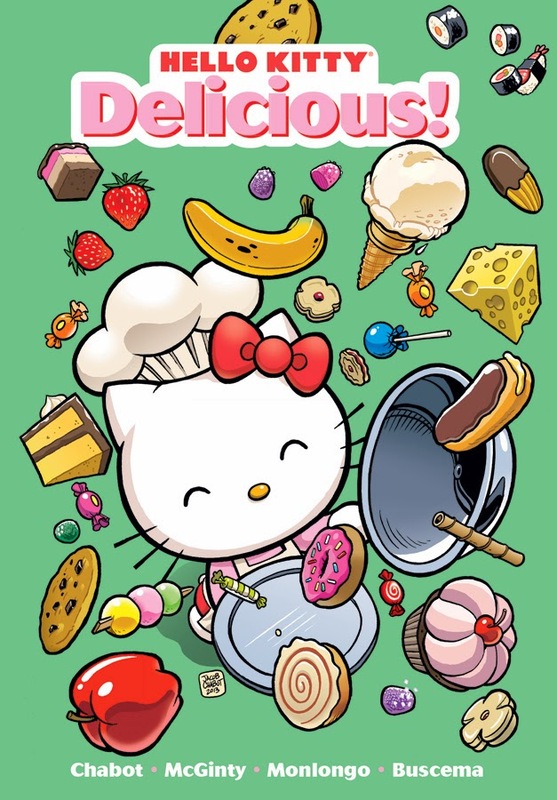 You’re the “special guest artist” on Hello Kitty Delicious! How did you get involved in the book and what does being a special guest artist entail? I was contacted by VIZ probably about a year ago, they felt my work would be a good fit for the book and of course I said yes! How could I not?! My duties as a guest artist were to come up a couple of one page gag strips, as well as painting a large landscape painting to be used as the end papers for the book. SANRIO CO. LTD. Used under license. Were you a fan of the Sanrio characters growing up and who is your favorite? Was that character also your favorite to paint? I was a huge Sanrio fan growing up, still am. I’m a little old school when it comes to choosing favorite characters. Aside from the obvious Kitty White, I love Tuxedo Sam, Little Twin Stars, My Melody. Sweet Coron and Pandapple are probably my favorite contemporary characters…but if I had to choose ONE, definitely Tuxedo Sam! Him and Sweet Coron were high up on my favorites to paint in the book. Hello Kitty has no mouth. How does she eat? It’s there, just not visible most of the time! This past autumn you had your first solo show, STRANGE AS IT IS. Where can fans see your upcoming work? I did, it was a great experience and definitely fueled a lot of art and work related goals for 2014 into 2015. I’ll be continuing to paint monthly comic covers, contributing to more gallery shows through the year and I’ll be working on some really exciting non-comic/publishing related collaborations that will be released/announced this Spring/Summer. I have a few other things cooking as well and will have weekly and monthly updates over at my blog, http://stephaniebuscema.blogspot.com. Your story is called “How To Bake a Cake.” What are your top 3 favorite cakes?